The winter nights are rolling in, giving me even more reason to fill up the bath and soak away the chill. Ok, so it's not like we really need an excuse for yet another long luxurious bubble bath, but, with the winter bubble bars Lush are in the process of releasing, an excuse is handy to have! I popped into my local Lush to see for myself what was on offer in their Halloween line and was instantly taken by The Wizard, I mean come on, just look at him! He has a cute little hat, teeny eyes and smells amazing! Without persuasion he went into my basket and came home with me! Weariness be gone! 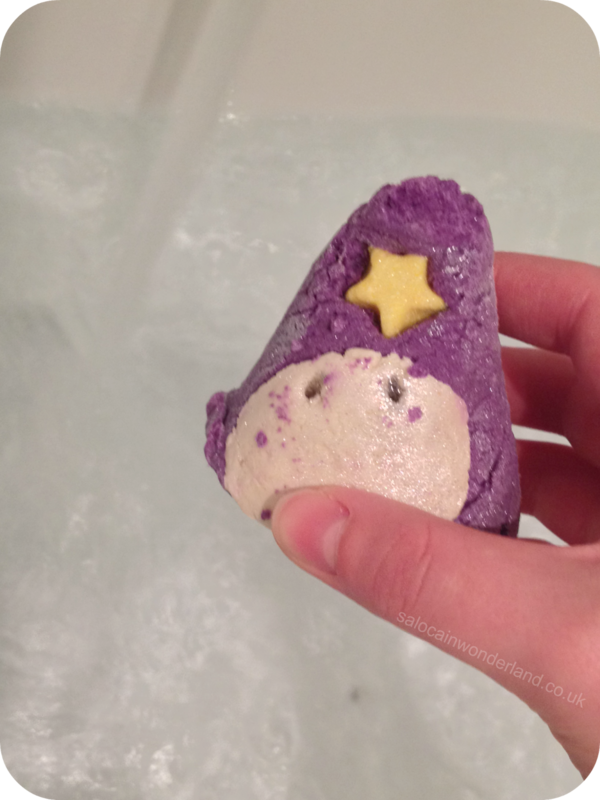 When your day has been too long or you've over done it the night before, this little purple guy will cast a spell over your bath, not only transforming the water into a magical pool, but transforming your mind too. Made with fennel oils, tangerine oils and rejuvenating juniper, this is the ultimate in de-stressing and relaxing bath bombs. The Wizard will turn your water the most beautiful shade of purple that my camera failed to pick up. Not only that, but it fills your bath with the finest, shiniest, tiny silver shimmering particles that swirl mesmerizingly around you! I got lost just watching them, catching the light, they looked like little twinkling stars! One of the main ingredients in ylang ylang oil, one of my favorites! Not only is it nourishing for the skin, but it smells so heady and divine! It's a very strong lavender-like scent, both my bathroom and skin smelt delightful afterwards. My skin also felt really soft and nourished too. You really need to crush this little wizard up under running water to ensure it dissolves properly, and look out for the magical (and edible!) little golden stars that appear from within! I know I wasn't expecting those! I love how Lush hide little surprises in their bubble bars! As with all Lush bubble bars, I'm always a little worried about the aftermath, especially as my bath suite is bright white! After draining the bath, thankfully the suite was still nice and white. The silvery magical glitter had turned into a grey scum around the bath, but that was easily washed away with a blast of the shower! Happy days! 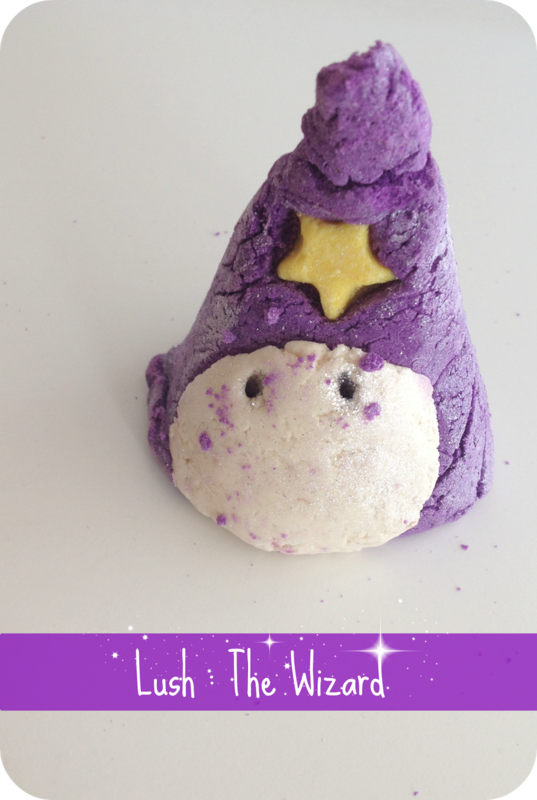 If your looking for a little magic the next time you hop in the bath, then I think you'll fall love with The Wizard - but grab him quick folks, after Halloween he will magically disappear from the shelves! I know I'm tempted to pick up another one in time for the post-party recovery season! Have you tried The Wizard, or any other of the latest releases from Lush? Let me know in the comments below! I don't get the different between a bubble bar and a bath bomb. Help. I think bath bombs tend to just make the water all pretty and fizzy, where as a bubble bar does the same thing but with ALL the bubbles! Or it's just a marketing ploy that I fall for hook, line and sinker haha! Well, they say edible stars but I didn't feel brave enough to try! Guess it's in case you accidentally swallow half the bath water?? I can't wait for all the Christmas bath goodies, especially Snow Fairy! Love that scent!